403 pages | 90 B/W Illus. Nanoparticles have a physical dimension comparable to the size of molecular structures on the cell surface. Therefore, nanoparticles, compared to larger (e.g., micrometer) particles, are considered to behave differently when they interact with cells. Nanoparticles in the Lung: Environmental Exposure and Drug Delivery provides a better understanding of how inhaled nanoparticles behave in the human lungs and body. Featuring contributions from renowned subject-matter experts, this authoritative text describes the sequence of events that nanoparticles encounter in the lungs when moving from the air into the bloodstream. This includes deposition, interactions with the alveolar surface and epithelium, translocation across the air–blood tissue barrier, and accumulation in the body. In addition, the book addresses practical considerations for drug delivery to the respiratory tract, drug and gene delivery in the lungs, and bio-nanocapsules. It considers the physicochemical, colloidal, and transport properties of nanoparticles, and presents cutting-edge research on special issues such as dosimetry for in vitro nanotoxicology, nanoparticle deposition in the developing lungs, and the potential for nose-to-brain delivery of drugs. Nanoparticles in the Lung: Environmental Exposure and Drug Delivery offersthe most updated and comprehensive knowledge of the risks and benefits associated with nanoparticle inhalation—to protect humans from any harmful effects and to explore the utility of nanoparticles as drug delivery carriers. 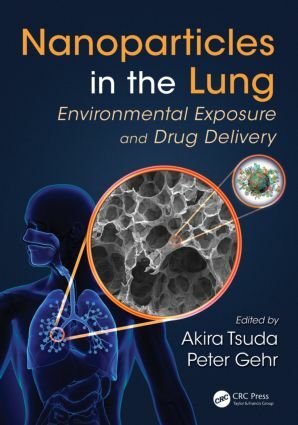 "The book presents the state of our current knowledge of the pulmonary-nanoparticle interface in a balanced, extensively researched way… This is a great reference text that I would want on my bookshelf. It also should be on the bookshelves of all students of nanomedicine." "This book is an incredibly timely and relevant contribution to the scientific community, as nanotechnology advances at breakneck pace. Emerging medical applications as well as the potential for unwanted or adverse health effects due to nanoparticle exposures are both addressed in detail. This work will serve as an excellent resource for researchers, clinicians, public health professionals, and others who are working to advance the state of the science where nanoparticles and the respiratory track collide." Akira Tsuda is a principal research scientist in the Molecular and Integrative Physiological Sciences Program at the Harvard School of Public Health. He is the author of more than 100 peer-reviewed articles and mentor of postdoctors (Harvard School of Public Health and Harvard Medical School). He serves as a reviewer for many international scientific journals, as well as research grants. He was a member of the NIH Respiratory Physiology, Respiratory Integrative Biology, and Translational Research Study Section, and is currently on the editorial board of the Journal of Applied Physiology and Journal of Aerosol Medicine and Pulmonary Drug Delivery. Peter Gehr is a professor emeritus at the University of Bern. Previously, he was chair of the Institute of Anatomy. He has served as visiting assistant professor at the Harvard School of Public Health and guest professor at the University of Nairobi. He spent sabbaticals at the University of Western Australia, National Jewish Health in Denver, and Harvard School of Public Health. He is currently the president of the Steering Committee of the National Research Program on Opportunities and Risks of Nanomaterials of the Swiss National Science Foundation, and a member of the Swiss Federal Commission for Air Hygiene.